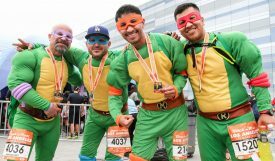 LOS ANGELES – August 21 – The United Airlines Rock ‘n’ Roll Marathon Los Angeles Half Marathon, today announced a partnership with Stan Lee’s Los Angeles Comic Con. The two costume themed events will return to downtown Los Angeles this year on Halloween weekend, October 27-29. As part of the partnership, event organizers have launched the Super Hero Challenge where anyone who attends at least one day of L.A. Comic Con and participates either the half marathon or 5K on Sunday will earn an exclusive special edition Super Hero Challenge Medal in addition to the finisher medal. Event goers can also enjoy discounts off both events. More information on the discounts and challenge can be found online. The Rock ‘n’ Roll Marathon Series is known for placing live music along the course to entertain runners as they make their way to the finish line. The race concludes with the Toyota Rock ‘n’ Roll Concert Series headlined by Theo Katzman outside the L.A. Convention Center. All race participants will earn a finisher medal, technical participant t-shirt and gear bag, complimentary beer, and admission to the Finish Line Festival with a free post-race headliner concert. Both events kick off Friday, October 27 at the L.A. Convention Center with Rock ‘n’ Roll’s Health & Fitness Expo taking place alongside the Comic Con festivities. The free expo is open to the public and will showcase the latest in running products, services and free samples from fitness experts as all registered runners pick up their race number, t-shirt and timing tag. The United Airlines Rock ‘n’ Roll Los Angeles Half Marathon will welcome more than 15,000 participants the weekend of October 28-29, 2017. Live bands and cheerleaders will entertain participants along every mile of the Halloween themed race, which starts and finishes in downtown Los Angeles and travels past many of the city’s landmarks. The race concludes with the Toyota Rock ‘n’ Roll Concert Series at the finish line by Theo Katzman. For more information or to register, please visit RunRocknRoll.com/Los-Angeles or follow @RunRocknRoll on Twitter.